AtmosCheerfx Santa's Visit Video - DVD Delight your holiday guests with a surprise visit from Jolly Old Saint Nick, or transform any television into a cheerful Yuletide fireplace with our Santa's Visit digital decoration. Each included effect is accompanied with both musical and ambient sound medleys, allowing you to create the perfect holiday environment. 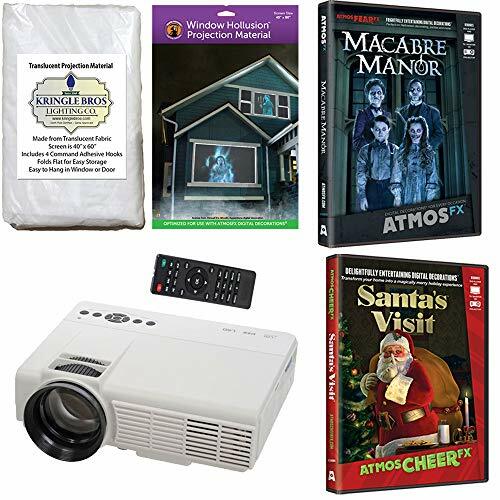 AtmosFEARfx Macabre Manor - DVD NEW for 2017 Use your projector or TV/monitor to display our ghastly AtmosFEARfx video effects and turn any environment or surface into a thrilling, haunted experience. Who are these strange residents of the long-abandoned Macabre Manor, and what happened to them? After centuries without 'living' tenants in their aged estate, the Lord and Lady of the House - and their twin children - have turned to haunting each other to pass their tedious, endless days..